If Mother Volga was and is in Central Russia, then in Siberia there is and will be Father-Yenisei. This is no less a deep river and no less severe. This is a purely Siberian river, but the truth is noticeably inferior in its length to the Volga. But the Yenisei is a wayward interlocutor. In the spring can so roam that will not find it. But never will be able to dry. It is replenished by cold taiga springs and small rivers. By the way, he has a brother and a sister – Cupid and Lena, also far from calm rivers. And as for the Yenisei, its shores are simply amazing! And what kind of mountain cliffs are there and what are the taiga forests and how many living creatures can be found in these forests – apparently-invisibly. But that was then, under Surikov, before the revolution. By the way, many may say this is what it Surikov, the Russian landscape painter brought in such a distance? And it was not easy to give it to him, it was his native open spaces. 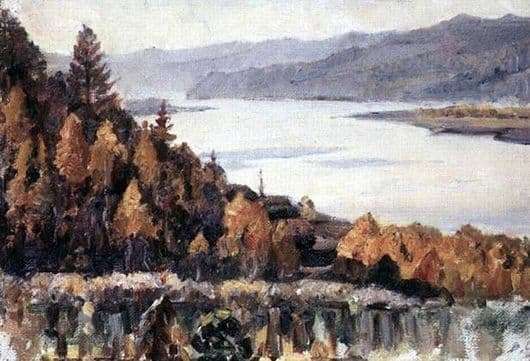 It was there that Surikov was born once and until the end of his life he remembered this and came there and on his canvases no-no, and he would draw taiga or river banks, or even the Yenisei-father himself. Here and there on the Yenisei canvas is full-flowing and winding. We see in the haze the mountain ranges that stretch to the water itself. Beautiful places there! And the taiga is real there and beautiful at any time of the year. Surikov did not detail the landscape, he made a general background, and it turned out that he believed in distant beauty, and in affluent waters. How many then fish lived in its waters! The old-timers said that even whales once swam. But this is probably the most likely legend or fairy tale. But who knows, maybe they have the truth. Surikov painted this landscape with tender love, and therefore it did not turn out so cold and somehow gloomy. There is much in it and tenderness, and love and devotion. So thanks to him, we understand that it is not so severe there.